In a convenient location off of I-695, this Pikesville, Maryland hotel provides easy access to downtown Baltimore and features comfortable accommodations along with many exceptional on-site facilities. The DoubleTree By Hilton Baltimore North Pikesville is only a short drive from popular sites such as the Inner Harbor District and Orioles Park. Camden Yards as well as M&T Bank Stadium are also easily accessible. There is a MTA metro station also nearby, which provides easy and instant access to many areas of the city. Modern rooms at the Pikesville DoubleTree by Hilton are furnished with signature Suite Dreams beds, high-speed internet access and MP3 compatible radios. Guests can also enjoy on-site dining at Fountainside Restaurant and Lounge along with state-of-the-art business and meeting facilities, tennis courts and a modern fitness center. Located off Interstate 695, this Pikesville, Maryland hotel boasts an on-site restaurant and offers warmly decorated rooms with free Wi-Fi and a cable TV. The Baltimore Zoo is just 12.3 miles away. 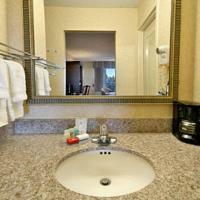 A microwave, refrigerator and coffee maker are provided in all rooms at the Ramada Baltimore West. Each room includes a work desk and a seating area. Italian cuisine is served for lunch and dinner at the on-site Olive Branch Restaurant and Lounge. This hotel also offers a daily continental breakfast. Guests can enjoy free access to the on-site gym and outdoor pool at the Baltimore West Ramada. The front desk is available 24/7. Pimlico Racetrack, home of the Preakness horse race, is just 4.7 miles from this hotel. The Edgar Allan Poe Museum and the Baltimore Convention Center are both around a 20-minute drive away.